This time a contribution from Yoav Ezer, the CEO of Cogniview. 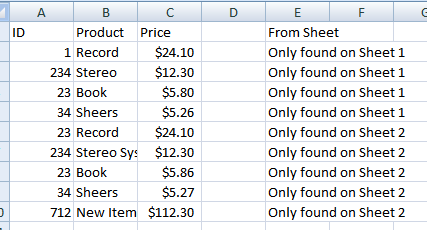 "Each month I have to compare two spreadsheets of products, each with the same header rows and same number of column. The number of rows are different each time. 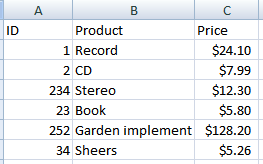 Is it possible using Excel to compare these two lists and show only the differences? I would love it if we could create a macro to solve this??" Seems like a cool challenge, and I would love to say I had a hand in coming up with the solution, but I am afraid it was the programming boffins at Cogniview who solved it! Several ideas were suggested and considered, including going through each sheet line by line using VB code. The problem always came when either or both sheets were really long and contained tons of data. Even on the fastest machine, it could be seen to grind to a halt. The answer was to use Excel's built-in function RemoveDuplicates to handle this. Unfortunately, that makes it a solution not available to users of older versions. We need two source spreadsheets to compare, then a target spreadsheet for the results, as shown below. Basically, this process requires our macro to perform two steps. Step one, we copy the first sheet's data to a new sheet and put the second's data after it, then we use the RemoveDuplicates function which removes the items from the second sheet that appear in the first. In the second step, we do the same again in reverse order - copy the second sheet's data and then the first, and use RemoveDuplicates again. The left over data in each case is the difference we need to display. All we need to do then is present the results. For each row, we state where the data was found. Most of the first routine sets everything up, copying the range of data as described above. The last two lines call our custom function LeaveOnlyDifferent. MsgBox "Please select different first and second sheets"
sheetResult.Range(sFromColumn & "1").Formula = "From Sheet"
This function is where the real solution lies, comparing and presenting the result. It accepts the sheets to compare and the destination, the columns and the first row. 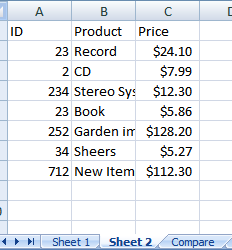 After copying the cells and removing duplicates, it copies the result to the top of the destination sheet. As mentioned earlier, there are many ways to solve this particular Excel challenge - how would you solve it? Could you see this solution as being useful? Please share your thoughts and experiences with us on Facebook or Twitter. This article was written by Yoav Ezer, the CEO of a company that creates PDF to XLS conversion software, called Cogniview. Prior to that, he was the CEO of Nocturnus, a technology-centered software solution company. 8FMsCz Wow, this post is good, my sister is analyzing these kinds of things, so I am going to let know her.